Ruth was born in East Walpole, Massachusetts to Fred Luther Graves (1875 – 1942) and Helen Vest Jones Graves (1880 – ?). In August 1915, when Ruth was 12, her father remarried to Harriette Ruggles Graves. In 1924, she graduated from the Framingham State Normal School Department of Household Arts (now Framingham State University) in Framingham, Massachusetts, and worked from that autumn in 1924 until 1926 as a home economics teacher at Brockton High School, Brockton, MA. On 26 June 1926, she married Kenneth Donald Wakefield (1897 – 1997) in North Easton, Bristol, Massachusetts. The couple had at least two children: a son Kenneth Donald Wakefield, Jr. (1928 – 1993) and a daughter, Mary Jane. Between 1926 and 1930, Ruth also worked as a hospital dietitian, and as a home service director for a gas and electric company. In 1930, Ruth and Ken took what was their life savings to date, and purchased a Cape Cod-style toll house just outside of Whitman, Plymouth County, Massachusetts on the road from New Bedford to Boston. Built in 1709, it had been an inn where people could enjoy a meal while the stagecoaches were changing horses and the road tolls were being paid. Ruth and Ken made it an inn again, calling it the Toll House Inn. They decorated the interior in traditional colonial styles. The restaurant was relatively small at first , with only seven tables, able to seat 30 to 35 people. Later, they would expand that to 61 tables. One room of the Inn, the Garden Room, was built around an elm tree growing in the centre of the room. Ruth did the cooking for guests; she became well-known for her lobster dinners, as well as colonial-era inspired New England meals and desserts. Very early on, in 1930, she published “Ruth Wakefield’s Recipes Tried and True” [Ed: in Brockton, Massachusetts. The first issue, actually undated, was possibly self-published.] The book would slowly pick up in popularity over the years (the library in Joplin, Missouri, announced it had it as a “new book” in 1937), be picked up by Little Brown and other publishers, and have over 30 revisions and reprints. Logansport Press. 16 February 1954. Page 6. ]The Toll House Inn became a destination place in the area for big events, and would appear frequently in the type of social columns that reported who celebrated what, where. All accounts give the invention as an “accident”, but it’s just as likely that Ruth, a trained Home Economist, knew exactly what she was doing. In any event, the cookies were made, with a blonde dough, nut pieces and small chunks of melted chocolate in them, and were popular. She decided at the time to call them “Toll House Crunch Cookies”, with the “Crunch” presumably reflecting the nuts in them. She seems to have shared her recipe freely, because other people started making the cookie, causing sales of the Nestle bar to ratchet up in the area. Nestlé’s sales people investigated, and discovered that her recipe was the cause. They negotiated a licence to use and promote her recipe, by reprinting it on some of their packaged chocolate products, through advertising, etc. One of the things that Ruth got in return was a lifetime supply of Semi-Sweet chocolate — though no doubt there was a monetary arrangement, too. At first, Nestlé started selling the Semi-Sweet Chocolate Bar that Ruth’s recipe called for pre-scored for easy chopping, then they introduced Nestlé Toll House Real Semi-Sweet Chocolate Morsels (aka chocolate chips.) And, they set about promoting the recipe. In 1939, Betty Crocker featured the recipe on the radio program “Famous Foods From Famous Eating Places.” In the spring of 1940, Nestle began to pay to run the recipe as advertorial in newspapers. Now, in the 21st century, Ruth’s name is mostly mentioned in connection with that cookie recipe — though the standard for chocolate chip cookie recipes has switched to being without nuts. In the decades that followed that, however, Ruth’s name was just as likely to be mentioned in connection with her recipes for lobster, Sailboat Lemon Meringue Pie, or Sea-Foam Salad Ring. The Wakefields sold the Inn in 1966 and retired to Duxbury, Plymouth County, Massachusetts. Ruth died in the Jordan Hospital, Plymouth, Massachusetts on 10 January 1977. She was buried in Mayflower Cemetery in Duxbury. She left her collection of cookbooks to Framingham State College. The new owners of the Inn tried to make it into a night club, but it was not a success. After four years, they sold it in 1970 to a family named Saccone, who turned it back into an inn under the same name — Toll House Inn. The building was completely destroyed in a fire on New Year’s Eve 1984 when a fire in an oven spread up the chimney stack and onto the roof. It was not rebuilt. “Four gunmen, who robbed the proprietors of the Toll House, widely known tea room, of $4000 in jewelry and $200 in cash, were hunted today along the back roads of Cape Bod and the Masachusetts south shore. They rolled the Toll house and the proprietors home, nearby, at approximately the same time, late last night. One of the robbers, posing as a patron of the establishment, awakened Kenneth Wakefield, who, with his wife, owns the tearoom, several hours after the Toll house had closed for the day. The robber said he had lost some tickets while having dinner earlier and asked Wakefield to open up the dining room for him so that he could search for them. Wakefield and the robber went to the establishment, where the owner was forced to open the safe and hand over $200 in cash. The owner had taken the precaution, however, to secret a large part of the holiday week-end receipts. Two other holdup men, members of the same party, went to the Wakefleld residence, meanwhile, stripping Mrs Wakefield of her rings and searched for other jewelry in bureaus and a desk. The fourth gunman waited in a car nearby. The couple did not resist the gunmen and no shots were fired. The robbers forced Wakefield to accompany them when they left and put him out of their machine several miles down a back road, unharmed. He walked to a nearby farmhouse and notified police.” — Four Gunmen Make Getaway. Lowell, Massachusetts. Lowell Sun. 3 September 1935. Page 1. Important: Cut the Nestle’s Semi-Sweet in pieces the size of a pea. Cream butter and add sugars and beaten egg. Dissolve soda in the hot water and mix alternately with the flour sifted with the salt. Lastly add the chopped nuts and the pieces of semi-sweet chocolate. Flavor with the vanilla and drop half teaspoons on a greased cookie sheet. Bake 10 to 12 minutes in a 375° F. oven. Makes 100 [Ed: sic] cookies. Every one will be surprised and delighted to find that the chocolate does not melt. Insist on Nestle’s Semi-Sweet Chocolate in the Yellow Wrap, there is no substitute. 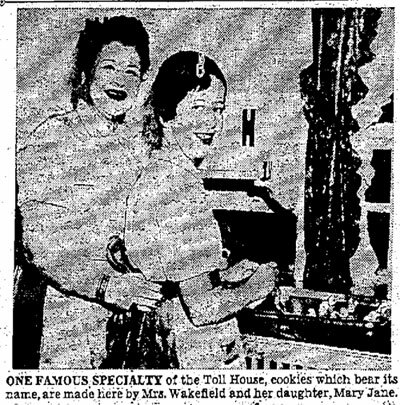 This unusual recipe and many others can be found in Mrs. Ruth Wakefield’s CookBook “Toll House Tried and True Recipes,” on sale at all book stores.—Adv.” — In: Syracuse Herald-Journal. Syracuse, New York. 10 April 1940. Page 24. “One of my wife’s favorite cook books of modern days is Ruth Wakefield’s “Toll House Tried and True Recipes.” This is done by a lady who knows what she is talking about, because she has fed a good part of the world at her Toll House, at Whitman, Mass.” — Driscoll, Charles B. New York Day by Day column. Joplin, Missouri: Joplin Globe. 21 November 1940. Page 4. “The romance of good cookery is unfolded in the pages of a new edition of “Toll House Recipes” which was received by the food page editor of The Sheboygan Press recently. The new volume celebrates the 10th anniversary of the opening of the inn in Whitman, Mass which serves thousands. The book by Ruth Wakefield is beautifully illustrated in color and contains hundreds of recipes which have given Toll House its fame. Quoting Mrs Wakefield, who with her husband invested their life savings in an old Cape Cod house and began feeding the hungry traveling public “There is a story behind every recipe in the book. Some were given to me by friends and pupils. Some I have created and developed to meet the needs of our hungry and ever increasing clientele. Several of the dishes included have been handed down to me by my family. Then Mr Wakefield and I have traveled in search of new foods. We used to go to Europe each year. We’ve been to Africa, South America, Central America, New Zealand, Australia and the South Sea Isles and Hawaii. Besides preparing adequately for her career, Mrs. Wakefield taught in the household arts department of a high school and was a hospital dietitian and a home service director for a gas and electric company before she and her husband bought the house built in 1709 which had been used as a toll house where stage coaches rested and changed horses. The young couple painted and papered the old inn, paid for all furniture and supplies and their venture was begun on the residue of their savings — $50. Today their staff of more than 100 men and women serves between one and two thousand persons daily.” — Romance Of Good Cookery Told In “Toll House” Book. Sheboygan, Wisconsin. The Sheboygan Press. 18 July 1940. Page 18. Place lobster on its back. Hold large claws firmly. With sharp knife begin at mouth and make incision, then split shell the entire length of body and tail. Remove stomach and intestinal canal, and a small sack back of head. Crack large claws and lay lobster open as flatly as possible. Brush meat with melted butter. Season with salt and pepper. For each lobster crumble soda crackers enough to fill body cavity, probably 5 or 6. Blend lobster tomalley and juice of 1/4 lemon. Add melted butter enough to moisten well and put into lobster body cavity. Cover body stuffing with an inverted pan while lobster is broiling. Remove cover when lobster meat shrinks from shell and allow crumbs to brown well. Twenty to 25 minutes is usually long enough but depends upon size of lobster. Serve hot with melted butter and wedge of lemon.” — Hines, Duncan. Lobster is Super. San Antonio, Texas: San Antonio Express. 26 July 1954. Page 1B. “Sea-Foam Salad Ring: To 1 pkg. lime gelatin, add 1 1/2 c. boiling water. Chill, and when gelatin is syrupy, blend in 2 c. (1 Ib) cottage cheese, 1/4 c. chopped green pepper, 1 tbsp. vinegar, 1 tbsp. grated onion, 1 1/2 tsp horseradish, 1/2 tsp. salt. Pour into big ring mold or 8 small ones and chill until firm. To serve, turn out on serving plate and fill center with fresh shrimp, crab meat, lobster or other salad. Serves 8.” — Sullivan, Joan. A good cook shares her secrets. Logansport, Indiana: Logansport Press. 16 February 1954. Page 6.